Eagles also sign QB Joe Callahan, he's just a training camp arm with Wentz on the shelf. Wheaton is in the mix for the 5th WR position. OK, why not? Eagles sign free agent RB Matt Jones (originally selected in the 3rd round of the 2015 draft by the Redskins). Strange move, as the 4th running back spot already has Adams, Smallwood and Pumphrey in the mix for it. The Eagles also came to terms with all five of their draft picks. First Philadelphia Eagle to make the Sunday NY Times Book Review? 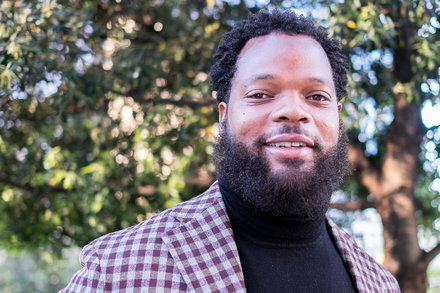 Michael Bennett’s “Things That Make White People Uncomfortable,” written with Dave Zirin, is both a memoir and a call to political action. Eagles are thin at LB. President Trump on Monday abruptly announced the Super Bowl champion Philadelphia Eagles would not visit the White House on Tuesday, citing the team's participation in national anthem protests. 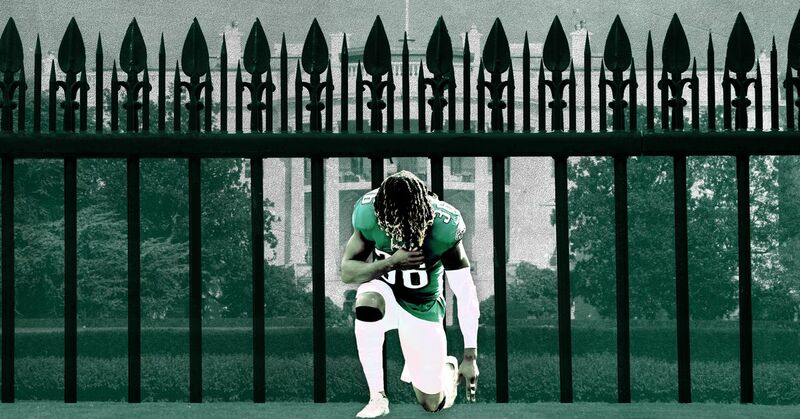 Eagles Univited from the White House. The man is a world-class jerk. Notwithstanding all his braggadoccio, being a jerk is about the only thing he's really good at (well, that and conning the rubes). The silver lining here is that this gives the Eagles an opportunity to tell Trump (and the NFL leadership) what they really think about him, and about the NFL's ridiculous capitulation to Trump over kneeling, and "patriotism" (which is to say jingoism). This is probably going to get pretty ugly and political the next couple of days. 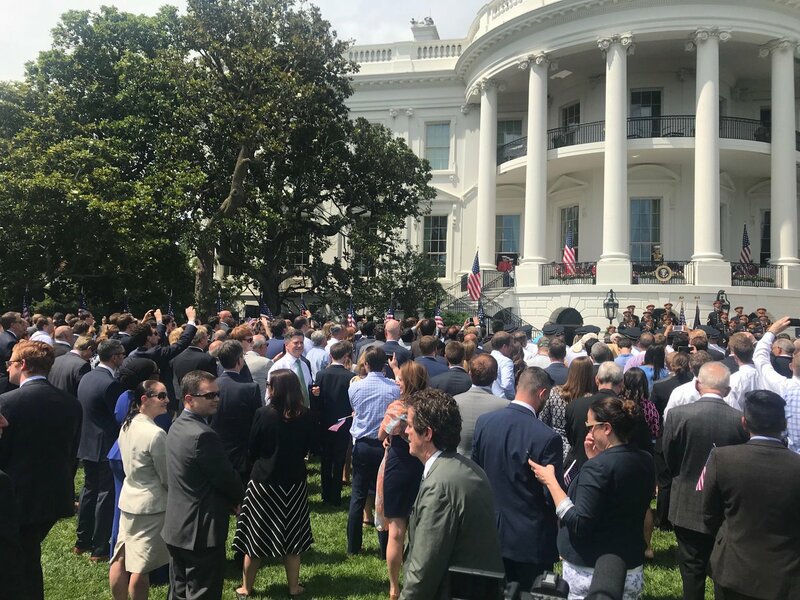 The turnout was going to be small but I am guessing it would have been respectful. This just ratchets up the partisanship for no reason other than Republican base politics. Trump has no clue that stuff like this does not really help with Independents though. I love the Wentz news! Umm...Yeah, I'm sure Eagles fans are going to see this as "the Eagles team decided to abandon their fans." Good luck with that one! And Fox News includes in its coverage a video of Carson Wentz leading several other Eagles players kneeling in disrespect pre-game, followed later by a lame apology that the footage wasn't related to the story, after they received taunting tweets of not being able to recognize a pre-game prayer. LOL, but Trump's base will believe it. Do all Eagles fans wear business suits? Notice all the green jerseys! And for someone so smart and patriotic, our Prez doesn't know a lot of the words to the anthem or God Bless America. On the latter he appears to know only 4 more words than the ones in the title. I see the NFL has passed a rule that teams can't actively attempt to remove snow from a particular spot on the field in order to assist a kicker's effort to get better footing or a clean placement on the field. From a couple different reports the language adopted was "It is impermissible for the grounds crew or other team personnel to clear away snow for a Try kick, field goal, punt, or kickoff." I have no problem with banning grounds crews etc. But is the league saying that if the players on the field want to use some of their huddle time to sweep snow away with their feet this is a penalty now? Stupid. Eagles restructure Ertz's contract to create over 5 million in 2019 cap space, bringing them to around 24 million in space. They'll need to sign their draft picks, but I imagine most of what's left after that will be carried over to 2020 for Wentz's extension. I'm borrowing this data from BigEd at BSG (and here). Here are 29 of the 30 official pre-draft visits for the Eagles. Draft starts on Thursday April 25 with round 1 (we pick 25 in the 1st). Rounds 2 and 3 on Friday (we have 2 2nd rounders but no 3rd). Saturday is Rounds 4-7 (currently have 2 4th, a 5th and a 6th). My preference is for one of the DL in the 1st and a RB and S in the 2nd. 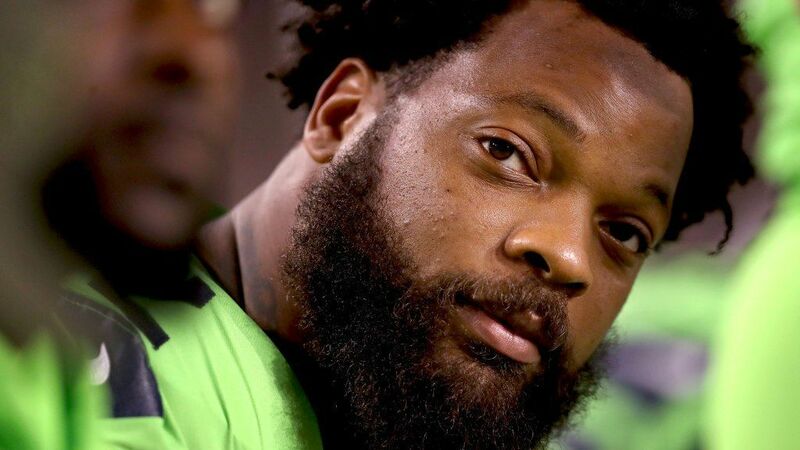 I think our greatest need is OL and I would go that route in 1st round if a stud is available then. While it is always nice to add plus DL, I don't see that as a crying need in this off-season. If the DL isn't at good as we wish, we may lose; if the OL isn't good, we may lose Wentz.